I promise I'm NOT trying out for Pinterest Mom of the year, but I keep finding FUN things to do with Addie (she's at the golden age for making stuff) and when I do, I can't resist putting my own spin on things. Of course I still procrastinate, so nothing is ever shared ahead of time! So, yesterday I saw my cute cousin, Lisa's IG post showcasing three super adorable valentine boxes. Addie and I had just discussed defaulting to the lame spray-paint-the-Kleenex-box version until we saw this much more interesting vending machine box. We decided to ramp up the creativity a bit and give it a go. After dinner I searched Pinterest, but struggled to find much beyond pictures that others have uploaded—in other words, no links to printables or instructions, etc. so we were left to our own devices and I figured if I was going to make this thing, then I should also make this thing easier for others. 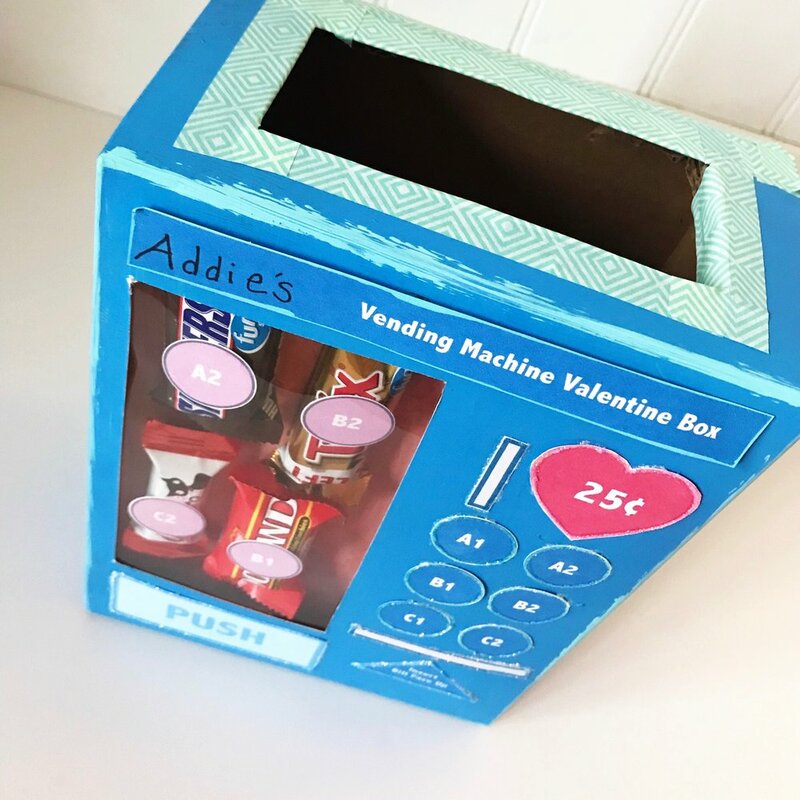 CLICK HERE to download a PDF with some helpful designs and instructions for making your own Vending Machine Valentine Box. 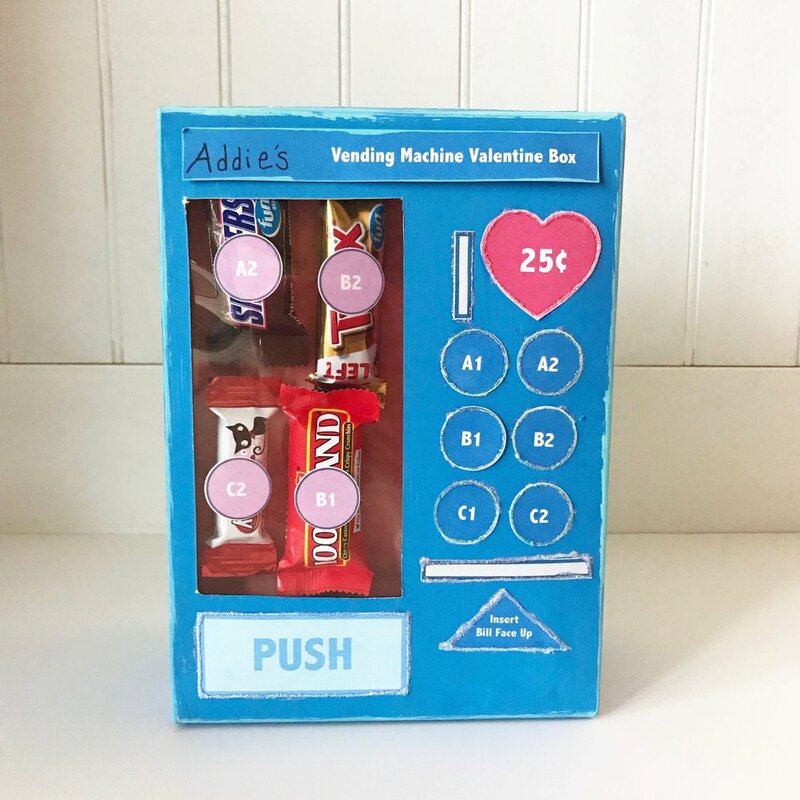 Our box is just a tad too small, so we could only squeeze 4 mini-size candy bars inside the viewing window, but the designs have enough buttons for up to six candy selections! After we stuck everything down, we added some clear glitter glue, because when you're ten, everything needs glitter! I think this turned out SO SO cute and it's far more impressive than the former repurposed Kleenex box plan.